A new signal averaging package from Spectrum Instrumentation revolutionizes the way that signals can be acquired and averaged. Signal averaging plays a crucial role in applications where signal details, hidden in random noise, need to be extracted and analyzed. 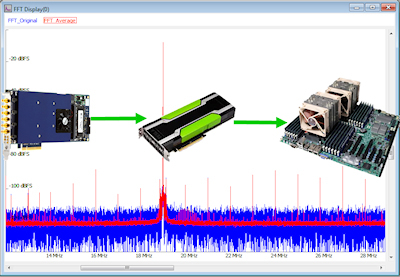 The new package uses SCAPP (Spectrum’s CUDA Access for Parallel Processing) together with the company’s latest digitizer products to harness the power of any CUDA-based GPU card. SCAPP gives users the ability to port data directly to the GPU, using RDMA (Remote Direct Memory Access) transfers, where high-speed time and frequency domain signal averaging can be performed without the length limitations typically found in other averaging products. The averaging package will be of interest to anybody working with signals that are low level or where signal details are lost due to high amounts of noise. This includes applications such as mass spectrometry, LIDAR, radio astronomy, automation, radar, biomedicine, sonar and many more. The Spectrum averaging package is part of the SCAPP driver package and includes the extension for RDMA that allows the direct data transfer from the Digitizer to the GPU. The package also contains a set of examples for interaction with the digitizer and a set of CUDA parallel processing examples for the basic averaging functions. Examples include time domain block, or segmented summation averaging (together with noise suppression methods as well as gap-free, frequency domain averaging). All the software is based on C/C++ and can easily be implemented and modified with normal programming skills. Starting with tested and optimized parallel processing examples gives immediate results and also permits customization for users who wish to utilize their own specific averaging algorithms. The package allows RDMA transfers directly to the GPU for PCs running LINUX, or via the CPU for systems using a Windows-based operating system.